Copyright © 2009 David F. Rogers. All rights reserved. Click image for a larger image. The airport is shown North up which is why the writing on the overlayed graph is upside down and backwards. The lower (southern) red dot indicates the approximate point at which the engine piston failed at 450-500 ft AGL. The upper (northern) red dot indicates the approximate point at which the aircraft touched down. based on the analysis in the Rogers AIAA JAC paper for a 10 mph wind from 45 degrees. with an engine failure at 650 ft AGL. 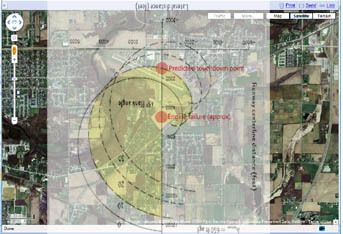 The illustration shows that the predicted landing site from the Rogers paper (Fig. 4) on the departure runway and the actual landing point from the Mooney video, estimated at 2/3 distance from the departure end of the 3000 ft long Rwy 18-36, i.e., with about a 1000 ft of runway remaining, are in reasonable agreement. Dave Keller is an instrument rated private pilot with 4700+ hours of which 2000+ are in Mooney 20Cs, he has had two. He has never had any acrobatic experience nor has he ever had any previous serious inflight emergencies. In talking to him, he estimated his climb out speed at 80 KIAS. He estimated his bank angle at 45 to 50 degrees. However, analysis from the video indicates that the bank angle was closer to 30 degrees. His over estimation of the bank angle is not surprising given that it is normal to over estimate angles. The buzzing sound in the video is the gear warning horn. The stall warning horn is only heard during his last realignment turn just before touchdown. It is unclear when he extended the gear. However, given when the gear warning horn is not heard, it is estimated that the gear was extended approximately when he knew he would clear the trees. This was probably earlier than necessary, but that is Monday morning quarterbacking. He estimates that his speed was approximately 80 KIAS until the last realignment turn. Eighty knots indicated airspeed is estimated to be a bit higher than the best glide speed with the gear extended which is estimated to be approimately 72-75 KIAS. Based on the time hacks on the video, the entire flight from "brake release" to touchdown was approximately 00:01:49, call it 109 seconds. From the failure to touchdown was approximately 60 seconds. That is not much time but is consistent with the analysis in the Rogers AIAA JAC paper. Dave Keller did a fine job. In no way do these comments intend to take away from his actions. However, we can all learn from this incident. The following comments are presented in that spirit. 1. Be prepared. Decide what you will do in the event of a failure on takeoff. Being prepared reduces reaction time. From failure to initiation of the right turn was between three and four seconds. Failure was at approximately 2:35:26 in the video. Notice that there was little, if any, pitch up immediately after failure. 2. Notice also that at failure and afterward there was very little vibration and the propeller did not stop, i.e., this was not a catastropic failure in which components of the engine left the aircraft or a complete loss of oil or engine stoppage occurred. This suggests that the engine was still producing partial power and hence thrust. A windmilling propeller, i.e., one that is not producing thrust but is turning the engine, results in significant drag. An engine producing even modest amounts of power/thrust significantly extends the "glide". Thus, unless there is an indication of fire, pulling the mixture immediately is not indicated. Furthermore, pulling the propeller control aft to increase the glide ratio is also not immediately indicated. If there is no indication of fire, pull the mixture and propeller controls on short final. If the propeller has stopped because of internal engine damage, pull the mixture, propeller and throttle controls. 3. As the overlayed plot in the image above, as well as the video, clearly show, a downwind landing on the departure runway may result in a "long" landing. Be prepared to slip to land. COMMENTS on the AOPA "video" presentation. 1. The accident database from which the FAA and the AOPA Air Safety Foundation (ASF) draws conclusions is seriously flawed. The database is incomplete. The database typically contains only negative outcomes. It is an accident database -- a negative database. The database does not contain information on successful (positive) outcomes. For example, Dave Keller did not report his successful turnback to either the FAA or the NTSB, nor was he legally required to do so. Conclusions drawn from incomplete databases are at best suspect. The FAA and the ASF both have a tendency to ignore the science and engineering in making piloting recommendations. 2. Given the short length of time between engine failure and touchdown, the AOPA video unqualified recommendataion to use a checklist is counter productive. Certainly a paper checklist is not useful--there is no time to find it, turn to the appropriate place and read it. Forget the paper checklist, fly the airplane. Any checklist must be mental and very short. As the Jett paper clearly shows, you absolutely do not want to use excessive bottom rudder, i.e., excessive rudder in the direction of the turn. If you do, then a spin (inverted) is almost assured. Speed in the turn as close to stall as is comfortable. The stall warning horn/light beeping/flashing off and on is near optimum. The completion of the turn requires approximately 15-20 seconds depending on the bank angle and speed in the bank. During the turn, concentrate on successfully completing the turn. That is the critcal part. This works for me. You may want to use something different. 3. The cited accidents used to illustrate why you should not attempt a turnback are poorly chosen. Reading the NTSB accident narrations shows that in one case the flight instructor tested positive for recreational drugs! In both cases, witness statements strongly suggest that excessive bottom rudder was used. If so, that is clearly pilot error resulting from lack of pilot knowledge. 4. There was no luck in Dave Keller's turnback, just skill.